Positively MAD, which stands for Positively Making a Difference, are committed to respecting your privacy and ensuring that we only communicate with you because we feel that you have a legitimate interest in our services. 'Spam emails are emails sent out to millions of email addresses to try to gain personal information. Once the personal information has been gained, fraudsters can use it to commit fraud, which could include financial institution fraud, credit card fraud and identity fraud'. If you do not wish to receive marketing from us, please click the unsubscribe link or reply to us with the subject line UNSUBSCRIBE and we will remove you from our database. We are the UK’s largest and longest standing provider of student workshops, alongside inspirational and supportive sessions for parents and teachers. We are fully compliant with the PECR, Data Protection Act 1998, GDPR and are understand the guidance set out by the ICO and DMA. Our lawful basis for processing is ‘legitimate interest’. We will never share your information with any third parties. Why and how we contact you and our lawful basis for processing. Our ethos is to ‘inspire empowered learning’ by positively making a difference to as many students, teachers and parents as we can. The reason for our contact is to make you (schools) aware of our services. We are an educational training provider who have delivered in the marketplace for the past 18 years, we provide accelerated learning and personal development workshops for students, teachers and parents. Our workshops provide benefit to many schools across the country (we have testimonials, case studies and quantitative data to support this) therefore it is in the best interest of the schools that we inform them of what we can offer their students and staff. 1. Collect contact information from schools in the UK, so that we can send them direct marketing in the form of emails. 2. Promote our brand to schools, in the hope that they will invite us to deliver our workshops. The direct marketing we carry out is via email or occasionally via post. We do not ‘cold call’ - the only time an individual would hear from us via telephone is if they had showed interest in our services by clicking on our emails, enquiring with us or by meeting the conditions our any third party partners deem as legitimate interest. For further information about our partners, please see the section stating ‘how we work with our partners’. We have recently conducted an Information Audit along with a legitimate Interest Assessment to ensure that we are fully compliant with the new rules around personal data. We operate under a ‘soft opt-in’ policy relating to previous customers, which is approved by the ICO. This means that if you have bought from us in the past, we can assume that you are interested in hearing about our services still. We provide an ‘unsubscribe’ link (which is considered to be an ‘opt out’) at the bottom of all of our marketing emails. Please refer to the ‘what to do if you do not wish to be contacted by us’ section for information about unsubscribing from our marketing mails and your rights. School name, contact name, school address, job title, school email address, school phone number. From our understanding, this means that any information we hold which can be directly related back to the person is considered to be ‘personal data’. For example, if we just collected contact names without school name, job title, school email address, school address, school phone number and stored them on our CRM system, it would be very unlikely that the person could be identified. However, if we were to collect the contact name and school name, it is more likely that the individual could be identified. We do not hold or store any information about the contacts home address, personal phone number of any special category data, we simply hold information about the contacts role in the school so we can send targeted marketing to them. 1. Internally – we have a Business Administration Apprentice who uses ‘Get information about schools’ formerly Edubase (GOV.UK website) to search for schools. We invoice schools electronically via Sage 50 Accounting software (which only the Finance Manager has access to and is password secured) and post a hard copy of the invoice directly to the schools. 1) If schools send us a remittance via post, this information is stored in a locked cabinet, which only the Finance Manager has access to, before it is taken to our Accountants (MacKenzies Chartered Accountants). 2) If schools send us remittance via email, the details are stored in a secure folder on our Finance Manager’s computer, which only the Finance Manager has access to. 3) It is very rare that schools send us their bank details, because we do not pay them. However, if they do, the details are stored in either the locked cabinet or file on the computer. No bank details are stored on our CRM. - OFSTED grade: We are more interested in schools who are graded Requires Improvement or Inadequate in ‘achievement’ and ‘quality of teaching’ because we believe that they will be most in need of our support in comparison to schools graded Good or Outstanding. - Pupil roll: Because we are able to deliver to up to 300 different students per day, we ensure that we target large schools who are more likely to possess the budget to invite us to deliver. - Location: We are aware that there are certain ‘opportunity areas’ in the country who are deemed as requiring more support for various reasons including – proportion of disadvantaged students in comparison to the national average. Because we are able to provide workshops which focus on upskilling and raising standards, we focus on gathering information from these areas in the first instance. If we cannot find the above information on the schools website, we add the schools generic email address and contact details into our system and send our marketing emails to them. In most cases, we receive a response from a contact who is interested, who we then add onto the system. We no longer work with any third party companies, however, the agreements we had with our partners, Sprint Education and Hamilton House, were the same. We provided them with the product we wanted them to promote and they sent email marketing on our behalf. Their privacy policies are compliant with the GDPR and their policies can be found on their respective websites. Sprint Education have created a number of documents relating to the GDPR which have ensured us, as customers, that they are fully aware of the implications. We would then contact the individual via telephone in the first instance, then via email to inform them that we have information to state that they are interested in our product and ask them if they require any further information. The agreement we had with Spirit (the Education Company) is that we were provided with access to their ‘datamining’ platform which allowed us to send marketing campaigns to their database. All of our emails have an unsubscribe link, please click on this and it will automatically unsubscribe you from any future marketing mail. Alternately, please send an email with the subject line ‘UNSUBSCRIBE’ to info@positivelymad.co.uk and we will manually unsubscribe you. 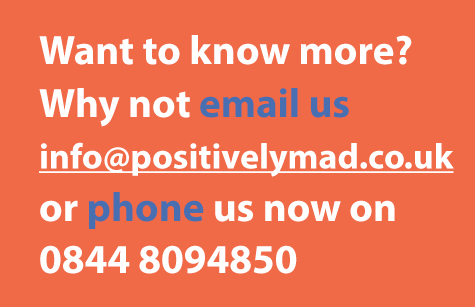 After you have unsubscribed from all future marketing mail, we remove your email address from our system but we keep your name with unsubscribed@positivelymad.co.uk as the email address. This is because we want to make sure that you are not added to our system again at any point in the future. If you would like us to completely remove all of your details, please let us know using the email address above and we will happily do this. However, when we come to update our database in the future, because we would have no evidence of you in our system, we could not guarantee that you would stay out of our database. You have the right to be informed why we are processing your data and the right to ask to be removed from our marketing emails. All data we collect is stored on our CRM system, Salesforce. Salesforce is considered as being the most trusted cloud CRM platform. School financial information is stored by our Finance Manager on Sage 50 Accounting, which ensures that ‘Your data is secure and protected with encryption and secure sign in’. ‘In the case of a personal data breach, the controller shall without undue delay and, where feasible, not later than 72 hours after having become aware of it, notify the personal data breach to the supervisory authority competent in accordance with Article 55, unless the personal data breach is unlikely to result in a risk to the rights and freedoms of natural persons’. ‘However, if you decide you don’t need to report the breach, you need to be able to justify this decision, so you should document it’. In the 18 years since our company was founded, we have never experienced a security breach. The impact of a breach on our system would be minimal because the only data which could be stolen is already available in the public domain. Data stored on Sage 50 accounting is encrypted, therefore, the only information which would be at risk is on Salesforce, which would show any correspondence between a contact at a school using their school email address and our Head Office team. Obviously, this isn’t ideal as we pride ourselves on building relationships with customers and providing a personal service and we would not want anyone else to have access to this kind of information. However, the only matters discussed in emails are relating directly to our services, so they cannot be deemed as sensitive. Individual students are not discussed, so we hold no information related to children of any kind. Managing Director, Operations Manager, Finance Manager, Events Co-ordinator and our Business Administration Apprentice. Each individual has their own password to access Salesforce and the platform is never accessed from a shared computer. All computers in the Head Office and Finance Office have inbuilt security software which covers malware, viruses and any potential security breaches. This policy was reviewed on 18 April 2018, by Laura Moran, Operations Manager, Positively MAD. Positively MAD, Osborne Stable Block, York Road, East Cowes, Isle of Wight, PO32 6JU.